A jury of six women and six men decided against Ellen Pao’s claims that gender discrimination was to blame for her not being promoted at and eventually being fired from Kleiner Perkins Caufield & Byers, a Silicon Valley based venture capital firm. Despite the ruling, the media coverage has ignited a national discussion about gender equality in employment. Underrepresentation in certain industries, unequal pay, and a shortage of leadership roles for women have all been cited as evidence that gender bias is still part of our social fabric. In this episode of Lawyer 2 Lawyer, hosts J. Craig Williams and Bob Ambrogi interview Laurel Bellows, former president of the American Bar Association, Renwei Chung, featured columnist and contributor to Above the Law, and Professor Melissa Hart from the University of Colorado Law School. Together they discuss why they believe Ellen Pao (now interim CEO for reddit) was a victim of gender discrimination and how the legal industry is still affected by gender bias. Ms. Laurel Bellows is the past president of both the American Bar Association and The Chicago Bar Association. Today, she is the founding principal of The Bellows Law Group, president of the International Women’s Forum Chicago, and serves on Minister Gordon Brown’s Global Citizenship Commission to update the United Nations Declaration of Human Rights. She is also the Chair of the American Bar Association’s Gender Equality Task Force. Mr. Renwei Chung is a featured columnist and contributor to Above The Law, where he recently wrote an article titled The Curious Case Of Ellen Pao And The Lesson We Can Learn From It. He is currently attending Southern Methodist University Dedman School of Law and is interested in startups, entrepreneurship, and innovative technologies. Advertiser: I think some of the stereotypes that people might have about Asians are also at play in some of the ways that people talked about Ellen Pao. The words that I was hearing, or reading, “not a team player, driven, intelligent, but difficult to be with.” These are the subjective evaluations that are generally applied to women. If we do nothing, it’s a status fall and five years from now it will be the same type of case and the same type of verdict. 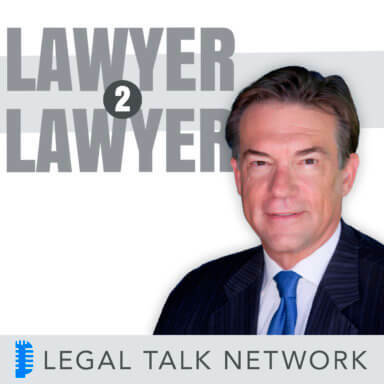 Craig Williams: Hello and welcome to Lawyer 2 Lawyer on the Legal Talk Network. This is Craig Williams coming to you from Southern California. I write a blog called May it Please the Court. Bob Ambrogi: And this is Bob Ambrogi coming to you just outside of Boston, Massachusetts where I write a blog called LawSites and another blog called Media Law. Craig Williams: Bob, before we introduce today’s topic, we’d like to thank our sponsor, Clio, and online practice management software for lawyers at GoClio.com. Bob Ambrogi: Well, Craig, the case of Ellen Pao v. Kleiner Perkins was decided last week. For anybody who hasn’t heard at this point, it was certainly one of the most notable or most covered workplace gender equity cases in recent times. It involved a high level venture capital firm of Silicon Valley. And in it, the plaintiff, Ellen Pao, who is currently working as an interim CEO for Reddit, sued defendant Kleiner Perkins for denial of promotions, alleging they were due to gender discrimination and also that she was unlawfully terminated for gender discrimination. Craig Williams: And Ms. Pao sought $16 million in compensatory damages in addition to punitive damages. And in the pending case there was a motion that many saw in it to eliminate punitive damage, but I believe was granted; so she was able to sue for punitive damages. But ultimately, a jury of 6 men and 6 women decided against Ms. Pao and all of her claims. But media coverage of her dispute has reignited a national discussion of gender equality in employment. Bob Ambrogi: To help us break down this case and discuss some of the broader issues around gender equality in various professional environments, we’ve got 3 guests today. Let us introduce them and then we’ll go into a discussion of the issue. First of all, I want to introduce Laurel Bellows. Laurel is the past president of the American Bar Association, also president of The Chicago Bar Association. She is the founding principal of The Bellows Law Group, president of the International Women’s Forum Chicago, and she serves on Minister Gordon Brown’s Global Citizenship Commission to update the United Nations Declaration of Human Rights. She is also Chair of the American Bar Association’s Gender Equality Task Force, although she is speaking today for herself, not the American Bar Association in any way. Welcome to Lawyer to Lawyer, Ms. Bellows. Laurel Bellows: Thank you, I’m thrilled to be here. Craig Williams: Also joining us, we have Mr. Renwei Chung. He is a featured columnist and contributor to Above The Law, where he recently wrote an article titled The Curious Case Of Ellen Pao And The Lesson We Can Learn From It. He is currently attending Southern Methodist University Dedman School of Law and is interested in startups, entrepreneurship, and innovative technologies. Welcome, Mr. Chung. Renwei Chung: Thank you, Craig and Bob, It’s good to be here. Bob Ambrogi: And last but not least, we have Professor Melissa Hart from the University of Colorado Law school where she teaches courses on employment discrimination, legal ethics, constitutional law, judicial procedure and judicial decision making. Prior to that, she practiced law for several years in Washington, D.C., including as a trial attorney at the U.S. Department of Justice. She remains active in the legal community, regularly handling pro bono cases and serving on the Colorado Access to Justice Commission, the Colorado Supreme Court’s Judicial Ethics Advisory Committee and Board of Continuing Judicial and Legal Education, and she now the director of the Byron White Center for the Study of American Constitutional Law. Welcome to Lawyer 2 Lawyer, Professor Hart. Professor Melissa Hart: Thank you so much for having me. Craig Williams: Before we get into the discussion of Pao v. Kleiner Perkins, we want to put you on the jury for a moment and take the first poll to have you vote whether she was a victim of gender discrimination or not. So just a simple yes or no and we’ll go around first and then have a discussion about that as we go on. So, Mr. Chung, let’s start with you. Renwei Chung: I do, I believe she was. Craig Williams: Okay, and Laurel? Laurel Bellows: Yes, gender discrimination. Professor Melissa Hart: And I agree, yes. Laurel Bellows: The perspective that I bring to you is a product of the work that I do. I represent men and women at senior executive levels who are in transition; they’re either looking for a job, are separating out of a job, or are negotiating an employment contract. The words that I heard – of course, we can’t substitute our judgement for a jury, because they heard the facts; and I’m a big believer in the jury system. On the other hand, the words that I was hearing, or reading, “Not a team player, driven, intelligent, but difficult to be with.” These are the subjective evaluations that are generally applied to women in terms of either blatant bias, or implicit bias; people that we don’t really care for but nonetheless are doing well. So when we talk about performance evaluations that are objective, we’re saying that you have a very specific revenue generation goal and you’re not complying with it and the others who are working with you, your peers. So I’m not reading about a very specific difference in revenue generation. I’m not reading about her inability to perform. I’m really reading mostly about subjective determinations of whether she’d fit in. And that’s the way all of the discrimination cases started initially many, many years ago in the securities industry. We just don’t think a woman can do this, we think she’s too aggressive, when she’s not aggressive enough she’s too weak; when she’s not doing it our way then she’s not doing it properly. So that’s the kind of immediate reflex sense I have of what I’m absorbing from just what I read because of course, I wasn’t sitting on the jury. Bob Ambrogi: Melissa Hart, what about you, what led you to say yes to this question? Professor Melissa Hart: Well, I think Ms. Bellows has put it extremely well. When you hear the kinds of subjective evaluations that constituted the poor performance evaluations that Pao received, you just have to stop and recognize that these kinds of subjective systems of evaluation are rife with the potential for and the reality of the discrimination against women and, frankly, against minorities and I think some of the stereotypes that people might have about Asians are also at play in some of the ways that people talked about Ellen Pao. So it seems to me that there’s a lot there that demonstrates the kind of stereotyping that women face in these industries and particularly when you read the descriptions that were given to her male colleagues, who wear the same kind of qualities who were described in very complimentary terms, in terms of aggressiveness versus go-getter kinds of things. So that really is what concerns me when I read about it, and as Ms. Bellows said, we weren’t there, but the accounts certainly suggest that that problem much exists in other industries as well. Craig Williams: Isn’t Kleiner Perkins’ defense here the situation that she was a poor performer? Isn’t that a bit bolstered by the Fortune 2012 article, I believe, that identified that Ms. Pao had degrees in engineering and law and an MBA. But when she went to work for kleiner Perkins, she was assigned to John Doerr who was in different industries, and as a consequence, Ellen Pao’s engineering and law backgrounds were out of place and not being used, and that was really what contributed to her poor performance and justified Kleiner Perkins firing her. What’s your thought about that issue? Laurel Bellows: Again, we’re not there, so we don’t know when they say poor performance, we don’t know precisely what they’re talking about and she could very well have been a poor performer. But she would have to be a poor performer measured objectively against her male peers, that’s number one. Number two is, when you’re talking about the VC business, or private equity business, you’re talking about a lot of common sense, business sense. It’s not the fact that a law degree could serve her very, very well in doing that because she understands the deals. She has to put together that she understands the details that have to be covered in order to put together and sell a deal and she has to understand what legal disclosures are and certainly is able to understand a regulated business. So I do not buy that part. I can not tell you, having not sat on the jury, whether or not she was performing equivalent to her male peers or whether she was not given an opportunity to grow and develop skills – which is another question which remains unanswered for me. But sometimes, women go into difficult situations but they’re able to be supported by the people who hire them and their skills are developed. So if she didn’t have the skills, then they shouldn’t have hired her. If she did have the skills, then they should have assisted to develop her in the same way the men did. If she wasn’t a revenue producer to the same level, then they have the right to fire her. But they shouldn’t be using the kind of language that we’re talking about now where it’s as Professor Hart said, complementary to the guys and disparaging to women. Bob Ambrogi: Some of the reports I’ve read about this case since the verdict came back said that even though this was a loss for Ellen Pao, it was nonetheless a win for raising awareness about the issue of gender bias in the workplace. Renwei, what do you think about that? Do you think that helped raise awareness and will help lead to positive changes going forward? Renwei Chung: I do, I’m very happy with the publicity of the case. Again, I respect the judicial process as well. I think under the current law and definition of discrimination, I can understand the verdict. It’s worth noting the reality. There is certainly gender discrimination under current law. But I think at this case and the public coverage of it brings these issues of the mainstream consciousness, and I think that’s really what we can take away from that. Laurel Bellows: First of all, I totally agree with Renwei. I’m sorry that Ellen Pao lost, and if the jury made a good decision based on the facts, that’s fine. As I say, I’m a believer in our jury system. But the idea that we are now having high profile and frequent conversations on this issue – which has gone to sleep to the American public – is tremendously important. Gender discrimination exists, barriers persist, and young people growing up who have been educated in maybe a 50/50 college environment, a law school environment, MBA, medicine, have to understand that the barriers still persist. Otherwise they come out and they enter their professions and then they experience some form of discrimination – which might be not as blatant as it was in the past – and they don’t recognize it and they blame themselves for not performing well. And that is a serious concern and lose confidence for the future. And so I’m delighted this is happening. Bob Ambrogi: And is that because she took the case to trial? A lot of these cases never make it there, they settle out of court. This one, I think as I recall, had an opportunity to settle out of court, but she wanted to push forward with this and have a full trial on it. And I think that’s part of what makes this case so unusual, it’s not just the fact that it did involve some big names in Silicon Valley, but that so much of this was laid out for the public to see. Professor Melissa Hart: I think that’s exactly right. If you look at civil cases in the United States, something less than 3% of them ever go to trial, and with employment discrimination cases, it’s even lower; they just don’t make it to trial. Sometimes because of settlement, sometimes as is the case here. Kleiner Perkins tried to keep it out of court by arguing that she had to arbitrate, and that’s increasingly common in employment claims because of the Supreme Court’s current jurisprudence on arbitration. So we rarely have a chance to have this kind of public erring on these kinds of issues. And that really, I think, is so important and it’s so unfortunate that we’ve lost that ability to have these cases get out into the public eye for conversations. Craig Williams: Isn’t this Ellen Pao’s second or third gender discrimination lawsuit? And I believe that her husband, Buddy Fletcher, has filed several gender discrimination lawsuits himself. So what kind of role does this type of pattern indicate to you as the potential for just simply, can this problem even be solved if she’s suing as much as she’s suing, or is there a question about the credence about what she’s suing for? Especially now that Kleiner Perkins has been vindicated? Laurel Bellows: Well I don’t know if they’ve been vindicated. The jury just found them not guilty in this case. I think there was enough testimony to indicate that there was a problem with the environment and there was some mistreatment, but at night it may not have been the reason for their termination of Pao. But what’s very interesting here, when you talk about settlements, it doesn’t go to trial, as Professor Hart says. One of the reasons it doesn’t go to trial is if the claims are accurate and the company is concerned about either their reputation or their client base or they really realize they have done wrong, they’re going to throw a lot of money on the table and the plaintiff is not going to walk away from that money simply to be as courageous as Ellen Pao was in bringing the case. Her other cases, I can’t speak to; if it came before the jury it could have certainly affected her credibility, and what her husband does for himself is a whole different manner as far as I’m concerned. But the issue is we don’t get to see the facts of these cases both because they are frequently arbitrated, particularly in the securities industry. Frequently arbitrated, which is a private venue. And it’s one of the reasons why there are arbitration clauses in most employment contracts in the securities industry and in the VC and in private equity as well. So this is a good conversation to have publicly to women who are thinking about signing a contract that has a dispute resolution provision that says arbitration. If they have a choice, they should preserve their right to a jury trial. Craig Williams: Before we move on to our next segment, we’re going to take a quick break to hear a message from our sponsor, but when we return we’re going to talk more about gender equality in the legal profession. Craig Williams: Welcome back to Lawyer 2 Lawyer, I’m Craig Williams and with Bob and I today is Mr. Renwei Chung, Ms. Laurel Bellows, and Professor Melissa Hart. We were talking about the Pao v. Kleiner Perkins case, but I’d like to talk about gender equality within, perhaps not only in the legal profession, but also within some of the other industries. Especially here in southern California, there have been some notable gender discrimination cases arising out of the trigative sessions of writers of comedy shows, where discrimination and a whole host of issues come up that courts have ruled, well, that’s just part of the creative process and that’s the way that TV shows get written so you can’t interfere with that. Will the Ellen Pao case make any change to these types of cases? Or are we experiencing this issue across the United States and across the professions? Professor Melissa Hart: I think I need to answer your question a little differently. So one again, barriers to women’s equality exist. Women are not paid equality – we have the facts – and women are not paid equally in the legal profession. I think the National Association of Women Lawyers’ recent study indicates that women equity partners are earning 89 cents on the dollar against male equity partners. And that’s a chunk of money when you’re talking about equity partner to equity partner over the working years over into retirement, you’re probably talking about millions of dollars. So that’s a fact that we need to consider. But the other issue here, which is in Pao but it’s also in every case, is if you complain about discrimination to your employer, regardless of the rules in your employee handbook, it is quite likely that at some time in the near future – generally within a year – you’re going to be retaliated against. Nobody wants to keep an employee who is complaining about discrimination, much as we’d like to believe that the world recognizes and that most corporations would be willing to investigate accurately. And you would come out as having brought out a bad act to your employer; that’s not the way that it works. And I think the Pao case and I think that the fact that we’re not seeing a lot of cases in law or anywhere publicly on gender discrimination is a function of the reality of the way that we handle discrimination. Bob Ambrogi: I couldn’t help in reading about this case to think about what it is like for women professionals in large law firms. I think a lot of people might not have even been aware of the fact that Ellen Pao herself was a lawyer who worked in a large law firm earlier in her career. But one of the things that struck me was that Kleiner Perkins was kind of the lack of any objective criteria by which the promotions to partner were made, and it seemed to have a lot of parallels to what happens in law firms. And to the extent, you might say that Kleiner Perkins won this or as Craig said earlier was vindicated. I wonder what that says about gender bias in law firms because there’s still that lack of objective criteria for promoting associates into partnerships and what that means for women in professional law firms. Does this give us any guidance there, does this give us any insights on what happens there? Laurel Bellows: Well here I can speak on behalf of the American Bar Association. So the ABA’s Commision on Women in the Profession and the ABA’s Gender Equity Task Force have done some very specific work here. So one on compensation, we’ve recently published information that’s publicly available and it is called Closing the Gap. And it’s closing the compensation gap and it’s directed to women who are in large law firms – all large firms, but particularly women in large law firms – talking to the law firms themselves about how to close the gap that may be an unintentional gap. The need for more transparency, so it shouldn’t be compensation determination shouldn’t be so behind or opaque. And the things that women should learn about how to negotiate their compensation within a law firm. And lastly, we have a program running right now called Power of the Purse, where we’re asking general counsel to take a more active role with their preferred provider or managing partners to talk about their expectations about racial and gender equity within law firms. And one of the ways of doing that is to ask the simple question, how many women are on the compensation committee of the law firm that you’re providing significant services to a corporation. So that’s one of the things we’re asking general counsel around the country to begin asking, just how many women are on the compensation committee, because we know if there are women there, there’s going to be a more open conversation and certainly more than one women. Craig Williams: Professor Hart, I just have to make the observation that here is a woman who is extremely successful. Her earnings would be in the stratosphere compared to any of the jury members that are going to sit on her jury, despite the fact of where the jury was. Is there any part of this verdict that relates to the fact that a woman’s essential financial peers are not on that jury and can’t be on that jury? Professor Melissa Hart: That’s a great question and I think one of the things that’s so complicated about talking about the jury’s verdict is that the jury is the one group of people in the country that didn’t have access to the way this was being covered in the media while they were hearing the evidence and deliberating. And I think one of the things that’s most interesting about what’s been covered is how it’s been covered in the media and how Kleiner Perkins talks about it in court is that there’s this sense of how outrageous it is that she is asking for $16 million. That just sounds like such a huge amount of money and yet pretty commonplace as an amount of compensatory damages for someone in that kind of an industry. Like you said, that must have been hard for some jurors to even comprehend and it may have made her seem rapacious – it’s maybe not quite the right word – but greedy to them. And I think that’s a concern, especially when you look at the things that the jurors have said afterwards about not finding her to be likable. Again, they must have felt some distance from her in part because of that as well. Craig Williams: Well she’s known as a perfectionist and as someone who is not one of the good old boys but would make sure that she dotted every I and crossed every T before she went to bed – just to quote that Fortune article I referenced earlier. That doesn’t make people likable. Laurel Bellows: It makes people quite competent and trustworthy, that’s number one. And number two, you say somebody asks for an increase or expects the same compensation her peers are getting – and I’m not talking about Pao now, I’m talking about generally women and the use of the word greedy or self-indulgent or self-promoting, as opposed to the guy who’s trying to earn money to raise his family is successful because he’s making a lot of money as opposed to greedy and is making a case for increased compensation based on his value to a corporation as opposed to self promoting. These are the different kinds of words that are indicative of the implicit and blatant bias that exist, particularly in a high profile business like this. If a man was earning $16 million a year, as many in Wall Street are, that actually is indicative as success to most. If a woman is earning $16 million, it might be indicative as success, but the jury starts to wonder, that’s a lot of money, does she deserve that kind of money? Is that not a greedy request as opposed to that’s what the guys make? Bob Ambrogi: Renwei, you’ve written about this case at Above the Law, but you come at this from a different perspective from probably any of us on this call because you’re still in law school and you’re looking ahead to a career. I wonder from that perspective what are you and your peers seeing in this case as it might pertain to you going into the law? Renwei Chung: That’s a great question. Again, I think it’s arguable if gender discrimination was a substantial motivating factor for some of these decisions. But I think in reality, it’s indisputable that the case was pregnant with gender bias. For me and some of my peers, we’re just thinking what would we have done if we were voting. And at the end of the day, I think we would have decided for Pao for a number of reasons. But again, looking forward, I think if this case was done 5 years from now, it probably would have went the other way. Laurel Bellows: And interesting from my perspective, and I agree with most of everything that Renwei has indicated and again with the caveat that we can’t second-guess the kinds of evidence that was there, the negative side of what Kleiner was bringing forward, we’re not emphasizing at all here. But I don’t know that 5 years from now it would be different, Renwei, and that’s the concern that I bring when I advocate for racial and gender equality. And that’s that women and people of color have been out practicing law – not in such quantities for people of color – but they’ve been out practicing law recognized as competent attorneys for years now. Women, since 1975 and Title 9 have been out as a third of law school classes since 1975. So there is actually no excuse at all to have a statistic and I saw that my statistics differ a little bit from some of the catalysts at 19% of equity partners. But I’m seeing 17%-18% of equity partners are women after all that time. There is absolutely no excuse not to have 30% women equity partners as an example and because of the top 200 largest firms are the only ones that we could really gather statistics from. And the inequity of pay and a world where we’re talking about 79, 77 cents on the dollar for white women. African American women in the 60’s, Latinas, even less than that. So when I joked earlier about celebrating my birthday on equal payday, equal payday is the day that women have to work until. So if April 9th is my birthday, then women would have to work until April 9 of the following year to make the same that men have earned the previous December 31, that’s what equal payday is. So when we come up with equal payday and celebrate it, so to speak, it’s not a celebration. It’s indicative that the barriers persist and things are not changing with time. Renwei Chung: I think where the forefronts of change within social norms, and I’m hoping that the law will mature to realize this. I guess what I’m saying is that by the year it might go the other way, I hope it’s because of cases like this. And even women suffrage cases, they lost at first, and it was only overtime that we advanced, that we matured and we realized that the progress of the human mind advanced and change the laws in institutions that we’re going to. But I certainly understand what you’re saying is if we do nothing and let the status fall, then yeah, 5 years from now it will be the same type of case and the same type of verdict. Absolutely. Craig Williams: Well, it looks like we’ve just about reached the end of our program, so we’d like to invite our guests at this point to share their final thoughts and their contact information so that our listeners can reach out and get in touch with you if they’d like to. And as you wrap up your final thought, the thing we’d like to ask you is what’s your takeaway on this case? We’ll start with you, Professor Hart. Craig Williams: Thank you. Ms. Bellows? Bob Ambrogi: Thank you, and Mr. Chung? Renwei Chung: I agree with both Professor Hart and Ms. Bellows. Again, I think law is an argue in science and even Supreme Court cases in the past have been involved. So I don’t expect juries to be 100% right, but I think the big takeaway is there needs to be objective measures. A lot of people use the excuse of how could you be objective when someone has the relationships that brings them certain clientele. Well that’s easy, you can see how it affects the bottom line. So I don’t think it’s that hard to be objective but I think it’s difficult to commit to being objective. And lastly, I think gender discrimination is pervasive in the science field and in law. And I think it’s something we do need to address and I’m very happy that Ms. Bellows said we need to be impatient, the time is now; I certainly agree with that. I think we have too many people talk about rights and focus on rights. We need to focus on our responsibility: our responsibility to the profession and our responsibility to society in general. And you can reach me on Above the Law. Bob Ambrogi: Thanks a lot to all of our guests for joining us today. We’ve been talking with Laurel Bellows of the Bellows Law Group, Melissa Hart of the University of Colorado Law School, and Renwei Chung who is a columnist for Above the Law and a law student as well. So thanks to all of you for taking the time to be with us today. Laurel Bellows: Thank you for having us. Professor Melissa Hart: Thank you. Bob Ambrogi: And that brings us to the end of our show today. And to all our listeners, thanks for listening. Join us next time for another great legal topic. When you think legal, think Lawyer 2 Lawyer.